Daniel, in New York City, is one of Daniel Boulud’s most famous restaurants. On 65th and Park Avenue, it does not get any fancier than this. I heard that Daniel offers a vegetarian menu, so my husband and I decided to celebrate our 3-year wedding anniversary in style. We arrived at 8pm sharp for our dinner. A little birdie told them it was our anniversary, so we got extra special attention. On top of that, we told them we are vegan and they were falling all over themselves to please us. I think they like the challenge! We enjoyed a three course prix fixe vegan meal that was colorful, creative, and delicious! They do a great job using seasonal ingredients. For fall, the menu is filled with heirloom tomatoes, butternut squash, and Brussels sprouts. It is hard to describe the inventive dishes that we were served: a masterful diamond-shaped corn cake and kale two ways. Best of all were the lettuce stuffed potatoes. We almost did not want to eat them because they were just too beautiful. 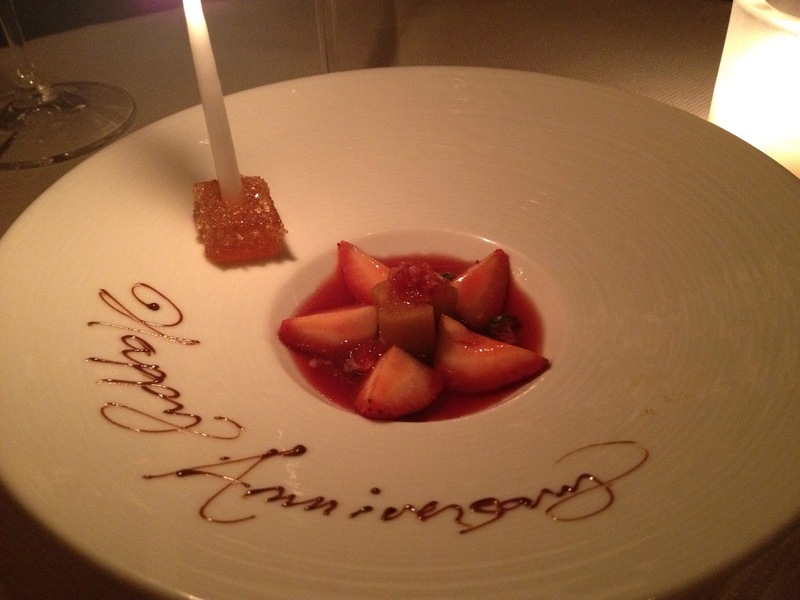 For dessert, a special candlelit Happy Anniversary sweet strawberry rhubarb treat. Overall: great experience, great service, great atmosphere, and great food.